Here at our horse riding stables in Lake Worth, we have two primary types of clients. The first are people who come back time and again for horse riding lessons, those who love horses and want to learn to ride in a variety of different styles. But not everyone is coming back every week for riding lessons. In fact, many people who stop by are here for one-time trail riding, whether it’s because they’re looking for a birthday party location or are on vacation and looking for something a bit less touristy. In this latter category of those booking horseback trail riding are people looking for a day retreat for their employees. Let’s take a look at why so many companies are choosing an office retreat at our stables. First of all, don’t have your “retreat” in the office. We have intentionally put quotation marks around the word in this case, because a retreat that is still in the office isn’t a retreat. It’s simply not a fun day if you decide to stay in the same place you work every day. Sure there are some fun activities that go on in an office, such as birthday parties and potlucks, but when a retreat is announced the employees certainly don’t want to “retreat” to the same place they spend every weekday. Every so often, employees need to feel that they’re really getting away (while still being paid!). They want to walk out those office doors and not look back for a few hours. Horseback riding in Lake Worth is the perfection option. There are many options when it comes to retreats, and far too many of them in the area are in buildings your employee pass on the way home! What we’re saying is, it’s not really much of a retreat at a fun center if your employees were there last week dropping their kids off at a birthday party. A retreat doesn’t mean you all have to be dropped off in the middle of nowhere to see if you can make it back to civilization. Our trail riding routes really aren’t that far away from downtown Lake Worth, but we are far enough away from the heart of town so that it still feels like an adventure to anyone who doesn’t get over into this much-greener area very often. It’s the perfect combination of an easily-accessible nearby location that still feels like an out-of-town adventure back in time. So many people get into routines that they don’t get to appreciate the Florida landscape. They might go from work to home, drop the kids off at school, maybe hit their favorite restaurant, and head out shopping on the weekends. We’ll admit, Florida isn’t really known for its trail riding. When people think of horse riding trails, they are more likely to think of western states. If they’ve done any horseback riding, they probably took a ride out in Yellowstone or Glacier National Park, which allowed them to be a cowboy for an afternoon. But horseback riding in Florida actually makes a lot of sense. Horses hadn’t existed in America for thousands of years until the Spanish started losing them around the year 1500, and Florida was one of their primary stomping grounds. So while most people don’t seek out trail riding in Florida like they might when they’re in the American West, it’s still a great experience that we bet they’ll love. One of the great aspects of trail riding with our horses is that everyone is performing the activity together and having the same experience. That’s not true of all retreats, where one person might be playing mini-golf, another bowling, and yet another snuck off to the bar. 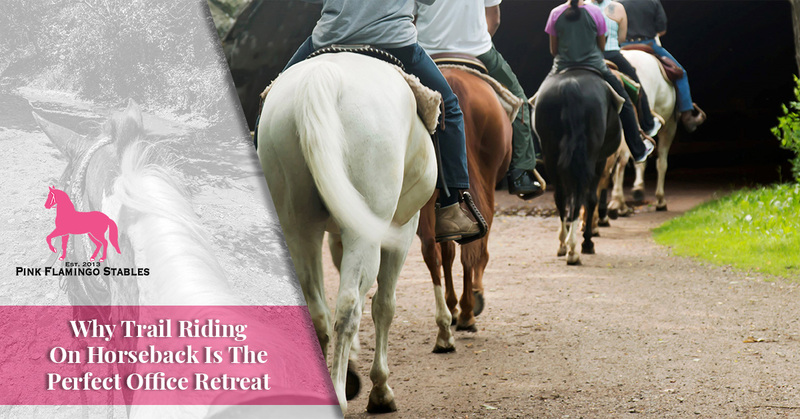 The point of a retreat is to do something together, and horseback riding means that everyone will be able to recall the fun time they had. It’s a bonding experience! Smaller companies don’t often have the luxury of having everyone take the entire day off for a retreat. Larger companies might have big retreats that last for days, but only a select few top employees are invited to go. Trail riding with Pink Flamingo Stables can be an excellent part of a morning or afternoon retreat for the office. We offer 30, 60, and 90-minute rides, so you can decide which one works best for your riders. As you can see, horseback riding in the Lake Worth area offers many advantages that you’re just not going to get with your typical corporate day retreat. When you’re looking for something new and exciting, we hope you’ll give trail riding a shot. If you think that horse riding might be an excellent option for your employees, we’d love to talk to you about it. Contact us today to learn more!